James makes it clear and straightforward to us about the expectations of our responses to God and to the devil – we are to submit to God, and we are to resist the devil. We were even told specially that when we reject the devil, he will flee from us. In this study we will examine the direct relationship between submitting to God and resisting the devil, and the qualities that we need to have in order to do so. Submit yourselves, then, to God – the phrasing here in the NIV is perhaps a little odd; Usually, such verses would be, Therefore, submit yourselves to God – which is how it was rendered in some versions. Yet other versions left out the ‘then’ or the ‘therefore’ completely. Regardless, looking at the context, James was last speaking about being humble, and how important it was that we must not be a friend of the world lest we incur the hatred of God. It is a no-brainer that submission requires genuine humility. When you submit yourself, you are acknowledging that somebody else has greater authority than you do, and that requires humility, especially if you’re the type who likes to be in control. Humble yourselves, therefore, under God’s mighty hand, that he may lift you up in due time [1 Peter 5:6]. It’s perhaps easier to convince yourself to submit to the will of God mentally than it is to submit to the authority of human leaders, who are often lacking in one way or another – God is almighty, omnipresent, omnipotent, omniscient. It is easy to agree to submit to a force that great. But it is perhaps the hardest thing to submit to God physically – as in, God is not physically in front of you when you say, okay, I give up, I give you the wheel of my life. And it’s not like there’s a physical wheel of life that you can pass to Him that ensures that once you lose it, you cannot reclaim that control that you’ve submitted to him. Anytime you’ve grown tired of waiting, it is simple to just take matters into your own hands again – there’s no physical limitations on us to constantly submit to God; there’s no CEO lurking around the corner making sure we don’t go out of the path he had demanded. On top of great humility, there’s a need for immense self-control and discipline. Resist the devil – Satan, and all that he stands for, ought to be regarded as our enemy, and opposed unceasingly. All the worldly temptations and distractions, all the self-important messages that stem from the world – that makes us uncomfortable with handing our submission to God; we ought to resist. In fact, it’s the same thing – if you resist the devil, you will naturally submit to God. If you do not resist the devil and allow yourself to entertain temptations and distractions and sins, you are obviously unable to submit to God. James put it clearly – Anyone who chooses to be a friend of the world becomes an enemy of God [James 4:4]. Even if you do not blatantly reject God, but not rejecting the devil, you are rejecting God without knowing it. We can’t have two masters – we cannot follow God if we follow the world. 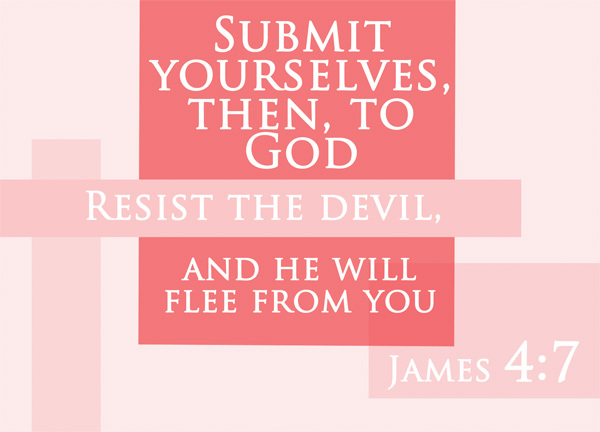 We cannot submit to God if we do not resist the devil. Put on the full armor of God so that you can take your stand against the devil’s schemes [Eph 6:11]. We need God to resist the devil – we seriously aren’t able to do it based on our own strength. At the same time, only by truly resisting the devil, will we find peace with God. and he will flee from you – Here is a great promise – we don’t see the devil physically, just like we don’t see God physically, since our naked eyes are not naturally opened to the spiritual beings. But we’re told that Satan will flee from us. He will run away, because he won’t know how to overcome those who has the presence of God in their lives. He won’t know, because he simply cannot. When the devil flees from us, it’s not that suffering will no longer happen to us – no, the devil is not the lord over such decisions, but God. When the devil flees from us, it simply means that we’re greater than the temptations and the distractions and all the other tricks that the devil has to lure us away from God and into sinning. Let us be alert, for the devil is crafty and his tricks are plenty. With cautiousness and awareness, let us resist the devil. With humility and discipline, let us submit to God. What are the temptations of the devil when compared to the boundless love and mercy of God? The devil may be often singled out as a villain in the Bible, but he is not the opposite of God. He is not an equal to God. At the end, all it takes for the devil to be subdued, is a single angel – not even an archangel [Rev 20:1-2]. There will be no epic battle between God and the devil. The devil, like us, was merely a creation. Make no mistake though, we’re not equals with the devil as well. He was given a certain degree of power, and as humans we have no chance against him – not unless we have God in us. Let us submit rightly, to God and not to another created being. Let us resist and reject the devil, and not the omnipotent God who can protect you and who will always want to give you the best. What a wonderful and powerful message. I like the new perspectives on a familiar passage. – If we are not rejecting the devil, then we are rejecting God without knowing it. The devil may be often singled out as a villain in the Bible, but he is not the opposite of God. He is not an equal to God.